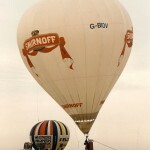 Home › Ballooning › Cloudhoppers › Smirnoff – Well they said anything could happen! Smirnoff – Well they said anything could happen! 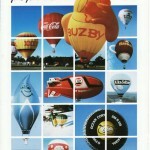 “Chris, When was your first hopper flight?” enquired that Hopper Devotee Mr Steve Roake? No idea, but I promised I’d have a look see. Now then, first off I had to find my old logbooks, which has proved to be less than easy, on top of this I have to admit that a lot of flights never got entered, usually the beer mat with the details scrawled on got washed or lost long before the event was recorded properly, then with the passage of time, it was forgotten until someone says ‘Here, remember that flight over the hill and far away’ and on attempting to look it up in aforementioned logbooks (if you can actually find the relevant one) you realise that it was left out so, for the moment, truth is then, unless I ever do find my early logbooks, I probably can’t tell you when my first hopper flight was anyway but it was in Smirnoff, of that I’m reasonably sure. But the puzzle doesn’t end there because unfortunately there were two Smirnoff hoppers. 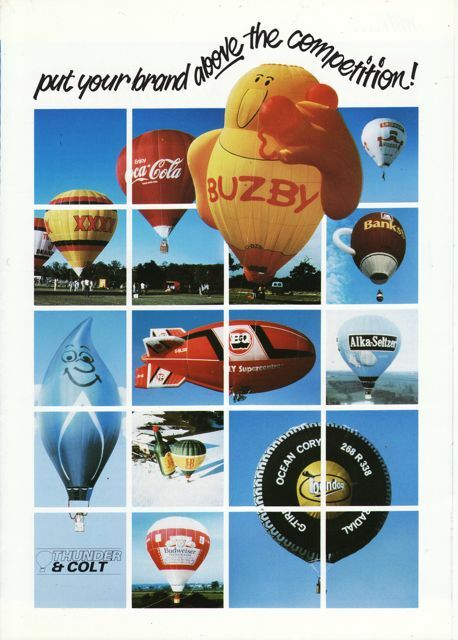 First was a Colt 14A built in 1979 and registered G-BIDV (International Distillers and Vintners Ltd) and operated by The Hot Air Balloon Company, then based in Chelsea, or it may have been G-BJXD a 1982 built 17A and also run by HABCo out of Chelsea. Robin Batchelor had flown BIDV down the rowing course during Henley Regatta (narrowly making landfall before it ran out of fuel) a year or so before I joined HABCo and it was pronounced knackered so it may well have been BJXD. Not sure which now I come to think of it anyway, the Smirnoff promotion then was ‘They said anything could happen’ followed by ‘Expect the Unexpected’, perfect for a hopper. I do recall flying G-BJXD from the Royal Crescent in Bath dressed in Tudor clobber but that’s another story and I think we took it to a One Man Meet once! 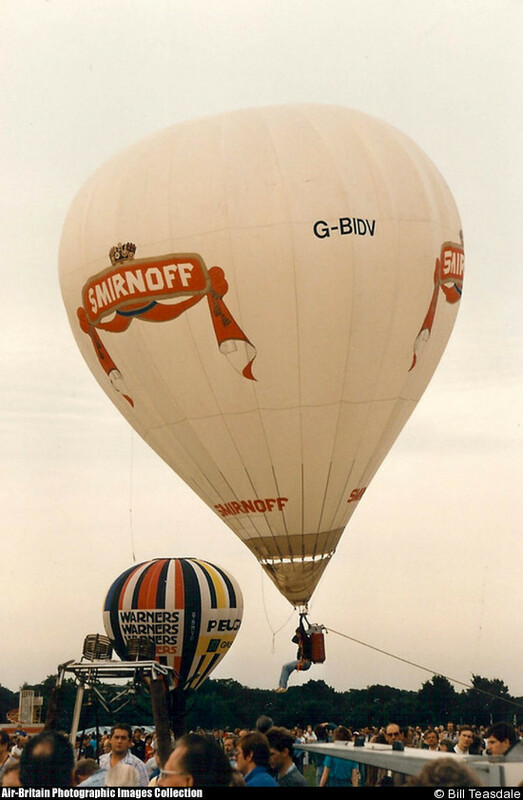 In 1983 Smirnoff Hot Air Airship, a Colt AS-42 G-WZZZ, , joined the hopper and made a few flights one, in 1986 or ’87 piloted by Mats Backlin, ending up in the toilets at Bristol when the pressurisation fan stopped and the ripline burnt through during the attempted recovery and sliced down the hull appearing out the nose, which was amusing for everyone except Mats and the occupant of one of the portaloos! 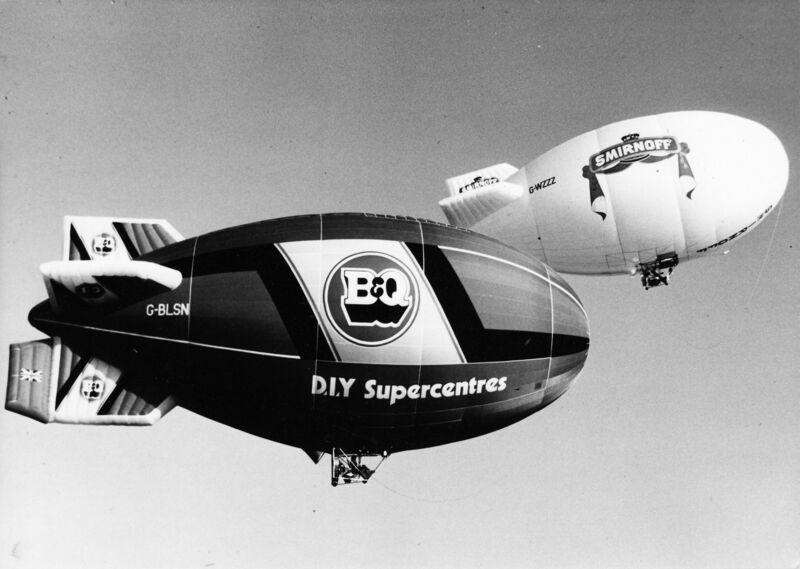 The picture shows the B&Q airship G-BLSN which was supported then by a ’31 probably taken shortly before the ‘incident’. 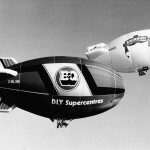 Airships never appealed as they were noisy and seldom if ever seemed to get airborne. When they did the engine invariably died and now all you had was a very unwieldy special shape. Being dragged sideways across a field in the gondola was no fun. Yep, the hopper was always going to win hands down. Colin Prescott was the ‘hopper man’ back then but he was not available for the job that had come up the next weekend (can’t remember where or what it was) and RB was busy being famous in Alka-Seltzer so I drew the short straw and was despatched off with it, which was fine, but having never flown one before or fought my way into the playground swingseat I reckoned a bit of a practice ought to be carried out first. So it was that we worked out how the harness and seat went together and trotted off to the Black Horse to give it a go. Colin Prescott’s last helpful tip was to ‘get the straps adjusted before you clip onto the cylinder’. Bad idea, once the leg straps were on I resembled a Chipmunk pilot waddling out to his plane, parachute strapped to arse, like they did, not having a cushion to sit on. Unclipped, things were a lot easier and straddling the tank with the envelope drum-tight a very quick and uneventful inflation occurred much to my relief faced with the tiny mouth and rather blustery burner flame. Once upright and clamped to the deck by willing volunteers it only took a minute or two to snap the Capewells closed, tighten up the straps and we were away. This was brilliant. I wobbled off down the valley towards Wendover spinning myself round and round until the inevitable happened and the rip line got tangled up with everything. A bit of reverse spinning and untangling followed by a very long burn prevented a premature landing I’m pleased to say. Now I’m not a watch person and so decided that I’d set the time at midday and fly for half an hour which ought to give me a bit of reserve for the landing. Doesn’t work like that. The old Thunder Cloudhopper bottom ends were equipped with a buzzer warning which went off (supposedly) when you had about 30% left. It did have a test facility which, now airborne, I decided would be a good idea to try. I flicked the chrome plated switch over to ‘test’ and it gave a squeak and that was it. Oh well, never mind, glance at watch showed quarter of an hour past twelve and the cylinder wasn’t rattling yet so plenty left. Cloudhopping clearly was most agreeable and although there was much to be learnt and, from the point of view that you are very much on your own, actually it wasn’t unlike gliding, quite selfish really. What was great fun was getting down really low and dobbing your toe on the ground then racing upwards with the ground receding away between your shoe laces. Contour flying the houses on the outskirts of the village got plenty of attention and with the wind falling ever lighter I elected to land on the road at the top of the old council estate. By now of course the cylinder was getting well rattly and the flame didn’t quite have to pathetic oomph it started out with, as a result I had precious little to do with the landing but to the outsider it was all so controlled and with the gentlest of bumps I was sitting in the middle of the road on a bend when I suddenly realised this wasn’t the brightest place to land, re-enforced by a car pulling up rather sharply! There was I having survived the flight and now about to be run over. No need to worry it was a known local who clambered out, rolled a stogey, pointed at the diminutive envelope as it gently settled over a Transit van and we commenced laughter. I reckoned there and then that I was going to enjoy flying these little devils. http://groups.yahoo.com/group/cloudhoppers/join where you’ll find all loads (66 or so) newsletters in the files section or if you are into Faceache become Steve’s mate where you’ll find a link. G-BIDV photo courtesy Bill Teasdale.